New York Fashion Week is just around the corner, and right now I’m focused on packing! Packing clothes, shoes, accessories, but most importantly, my camera gear. The critical point of packing my gear whenever I travel is choosing which lenses to bring. 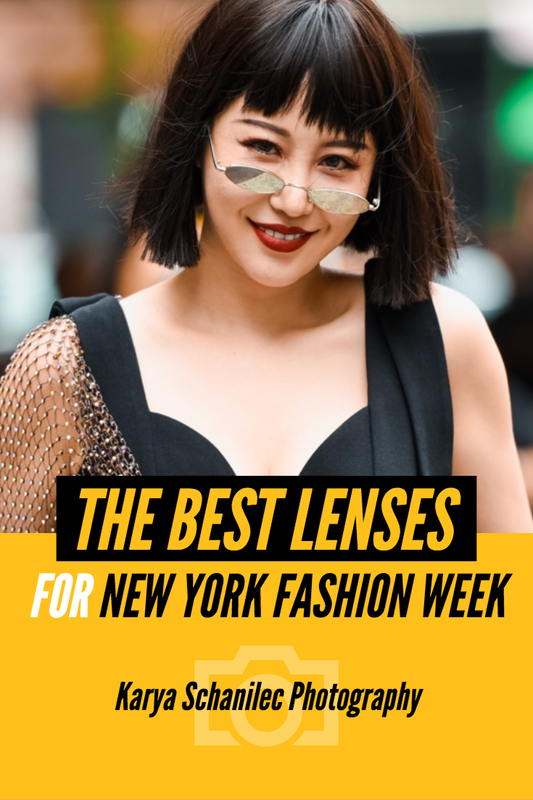 Since the right lens can make or break a photo for New York Fashion Week, I’m giving a rundown on the pros and cons of the most popular lenses I’ve seen on the street outside of shows and shooting the runway. Hopefully you will figure out what the best lenses for New York Fashion Week photography are for your style! Pros: Versatile lens that allows both wide and moderately cropped shots, and f/2.8 aperture allows for better defined focus. Cons: This lens can restrict you by not allowing you to get in close enough, especially for capturing details and when the subject is far away/not directable. Best for: Posed street photography, group shots, events. Used below by photographer Monica Aguiñaga. Pros: Wide aperture for better low-light performance, and creates more bokeh in street style shots than zoom lenses. Cons: Fixed focal length can limit you. Best for: Posed & candid street photography, some runway if you can crop the sensor or prefer a wider shot. Pros: This lens works great for low-light street style for getting in close, can be versatile for runway, and creates stunning bokeh. Best for: Posed and candid street style, runway. This lens is my go to for low-light street style photography! Pros: The most versatile of all the lenses, allows you to get in close to details and far away subjects, while also allowing for wide angle shots. Cons: The f/4 aperture can lend to poor low-light performance, and does not create as much depth of field or bokeh as f/2.8 or lower lenses. Best for: Posed & candid street photography, group shots, runway. Used below by photographer Ari Skin. Pros: This lens allows you to get super close in, especially for runway and street style when you may be behind many people who would otherwise block your shot. Also creates stunning bokeh for street style. Cons: Can be too close and too slow for some street photography and posed portraits. Best for: Candid street photography, runway. This lens is my go to for street style photography during the day! What lenses do you like to travel with? Let me know down below!